Henry H. ("H.H.") Cole was a well-known Tazewell County photographer. Over the years, he has become recognized as an early pioneer in the photographic art form. 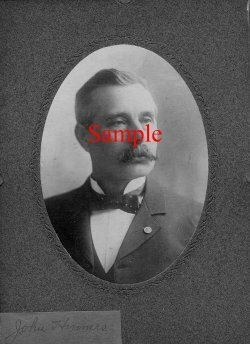 He was the originator of a historical picture gallery of notable Tazewell County residents displayed at one time on the hallway walls of the Tazewell County Courthouse. 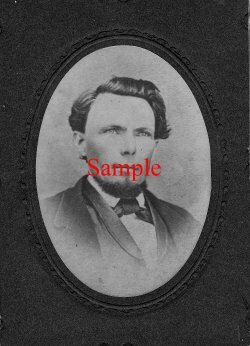 Here's your chance to own a photograph of your Tazewell County ancestor taken by the same man who photographed Abraham Lincoln! Check the list for your ancestor(s) (allow a few minutes for entire list to load). Note the photos you want and return to this page. Then make your order below. We'll send the digital image to you by email or on CD-ROM. 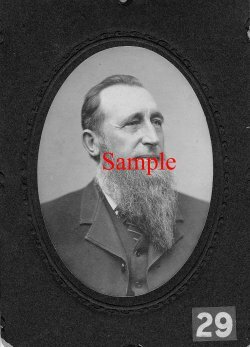 Or, if you prefer, we will print the 5"x7" photos on high-quality photo paper, suitable for framing and display in your home. Your choice for only $12.00. Orders may be placed at the Society's library, through the mail, or online using the form below. They will be mailed at you for no extra charge or you may pick them up at the library. Your order must be paid for before we print the photographs. To order a photo, fill out the form and push "Add to Cart". To order additional photos, press "Continue Shopping" to return here. To pay online by Credit Card or PayPal, press "Secure Check Out"